Using this test, it can be determined whether a problem is in an electrical circuit or if it is a mechanical problem in the transmission. If any abnormalities are found in the following test, the problem is in the transmission itself. (a) Disconnect the connector of the transmission wire. It is possible to deactivate the electrical shift control by disconnecting the transmission wire. The gears can then be changed mechanically with the shift lever. 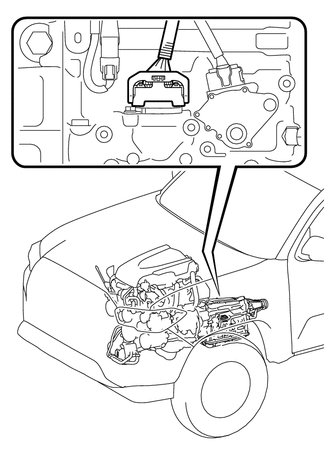 (b) Drive the vehicle with the transmission wire disconnected. Move the shift lever to each position to check whether the gear changes as shown in the table below. (c) Connect the connector of the transmission wire.